Birds will certainly flock to your backyard to dine from the Songbird Essentials Green and Brown Small Hopper Feeder. This wonderfully compact feeder not only has environmentally-friendly construction, it also holds just the right amount of seed for your feathered friends. Two clear plastic panels help create a seed reservoir, which holds 1.5 quarts of mixed seed or cracked corn. An integrated baffle at the base of the item keeps the seed moving to the attached bottom tray, and the steeply pitched, dark green roof protects the treat from rain. This lid lifts up the attached hanger for cleaning and refilling, and this cable enables you to hang the feeder virtually anywhere. Made from lasting, recycled plastic, this unit will retain its lovely green and brown colors for many seasons, and will not warp, chip, or rot. 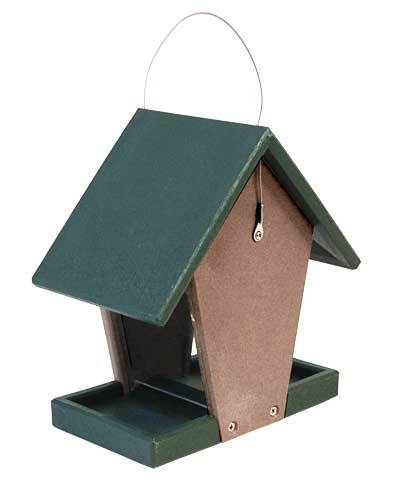 Offer birds a timeless feeding spot with this Green and Brown Small Hopper Feeder. Lifetime guarantee.